Thurston House, the best Bed and Breakfast near Orlando! 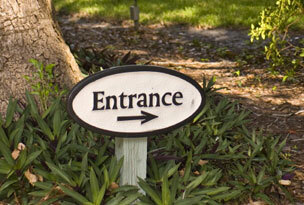 Find your way to the best Bed and Breakfast near Orlando! Most systems and maps show us incorrectly just before you get to us and will tell you to turn onto Park Lane. This is not correct! Please use the info on this page to make your way to Thurston House, the best Bed and Breakfast near Orlando! Travel Rt. I-4 West – Take exit #90, Maitland Blvd. At bottom of exit go left. Go over I-4 and take the first right – Sandspur. Go to the stop and go right – still Sandspur. Go to light and go left – Wymore. Follow to light and go left – Kennedy Blvd. (this turns into our street – Lake Avenue). We are just over 1/2 mile down on the left. There is a small Thurston House sign, you will not see us until you turn in… then you’ve arrived at the best Bed and Breakfast near Orlando! I-4 East to Exit 88 – Lee Rd. At bottom of exit, go right, then immediately get in the left lane to go left on Wymore. 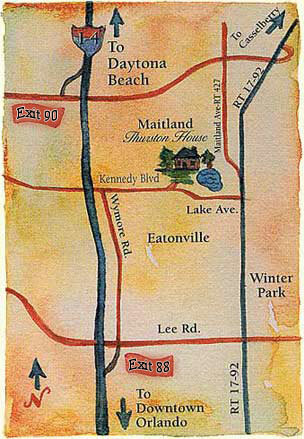 Follow to the first light – go right on Kennedy (Kennedy turns into Lake Ave in Maitland). From the time you turn right, we are just over 1/2 of a mile down on the left. There is a very small Thurston House sign, you will not see us until you turn in… then you’ve arrived at the best Bed and Breakfast near Orlando! Travel to North Rt.#436. Follow for 12 miles. Turn left onto Howell Branch Road. This will change name to Horatio Blvd. when you enter Maitland. Follow past 7 lights and go left at the 8th (approx 3 miles) on Rt.17-92, Orlando Avenue. Follow to the 3rd light (approx .6 miles) and go right on Lake Avenue. We are just over ½ mile down on the right. There is a small Thurston House sign, you will not see us until you turn in… then you’ve arrived at the best Bed and Breakfast near Orlando!